This season, Entrepreneur.com.ph offers Christmas Gift Ideas for Modern Entrepreneurs. Relax, unwind, enjoy, and reward yourself for all your hard work this year. Cheers to everyone! Christmas is usually the time of the year for most entrepreneurs to unwind with their family somewhere out of town. Not surprisingly, Tagaytay City is one of the most popular holiday vacation spots during this season. That could be attributed to the usually colder mountain climate and the proximity of the area to Metro Manila and provinces in the CALABARZON region. If you want to experience having more fun, chilling, and relaxing Christmas, take the invitation from Summit Ridge Tagaytay. The hotel offers quality and cozy accommodation at reasonable rates. Holiday guests will enjoy not only the fully equipped rooms, each facilitating an amazing view of the picturesque Taal lake and volcano, but also the rejuvenating amenities like swimming pool and spa. And of course, the much deserved Christmas experience will not be complete without the sumptuous meals provided by Summit Ridge Tagaytay’s food and breakfast partner and onsite dining facility C2 Classic Cuisine, which is part of the Cravings Group. This holiday season, the hotel has an irresistible offer for all entrepreneurs out there. Those who would book accommodations for December 24 would enjoy a festive Christmas Eve with delightful room inclusions like unlimited coffee and cake, pre-dinner drinks, access to activity stations (photobooth, arts and crafts corner, and Christmas movie screening room). Live entertainment would accompany the mouth-watering Christmas buffet dinner to be served at C2 Classic Cuisine. The package is wrapped with a yummy Christmas breakfast buffet on Christmas Day, December 25. Those who would book accommodations for December 31 would be rewarded with a blissful New Year celebration with these amazing room inclusions: unlimited coffee and cake, festive New Year’s Eve buffet dinner at C2 Classic Cuisine with live entertainment, post dinner drinks, access to activity stations (photobooth, unlimited sweets corner, cupcake decorating station, arts and crafts corner, and film showing room). It also comes with a delectable New Year breakfast buffet on January 1. These promos and more make Summit Ridge Tagaytay an ideal holiday vacation hotel in the refreshing and breath-taking city. The hotel has in fact become a holiday home to some loyal customers. “There are returning guests who come back every Christmas and already know and look for the staff,” said Pops del Rosario, the hotel’s manager, who is as cordial and hospitable as everyone in their team. Make a Christmas vacation in Tagaytay City part of your wish list for Santa Claus this year. 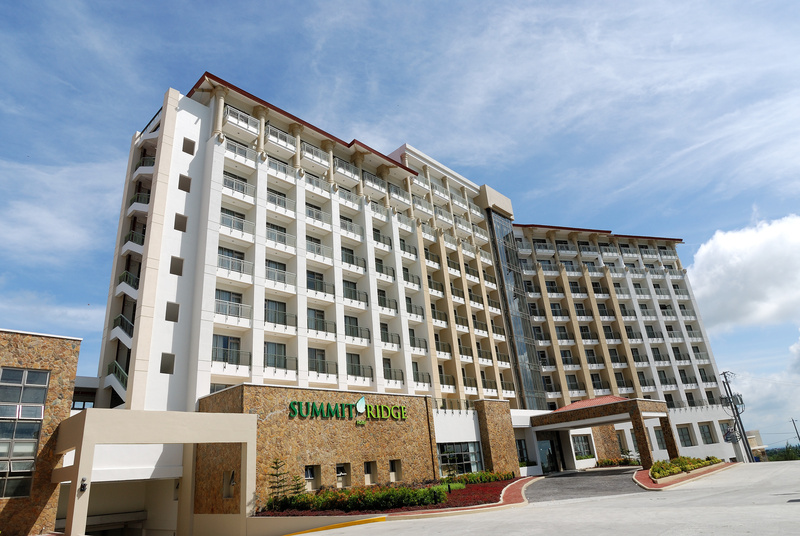 Moreover, make your holidays extra special and memorable this year at Summit Ridge Tagaytay. Book your Christmas and New Year holiday directly at www.summithotels.ph or all (632) 240-6888. Samples of hot items in the Christmas Eve Buffet Menu: jasmine rice, assorted buttered vegetables, crispy chicken prawn crackers, glazed ham, roast pork loin with prune apple stuffing, and nasi goreng. New Year's Eve Dinner Buffet Menu samples: paella Valenciana, slow cooked beef short ribs, crab stuffed fish fillet, yakisoba, vegetable melange, cheesy Hungarian meatballs, and jasmine rice.